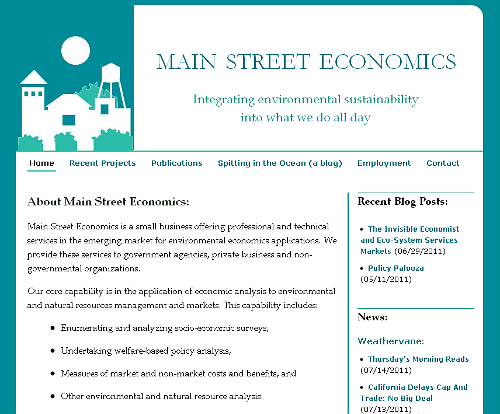 Rob Wieland, owner of Main Street Economics, contacted me in June of 2011 about renovating his website. The goal in renovating his website was two-fold: first, to have the design better match his company's logo and promotional materials; second, to find a more intuitive way of organizing and displaying his content. At the preliminary meeting, I suggested changes that could be made to improve his website, including: moving his blog to Wordpress and having it identified as a blog in the navigation, replacing the custom header image with his logo image and company title and slogan, and creating the color scheme from colors used in the logo. I also assisted Rob in creating a Wordpress account and instructed him on how to use it. Once the design was created, we met a second time. At this meeting, Rob suggested some minor changes to the design, which were made during the meeting. We also discussed the differences between designing for a blog and designing for a business website. The next step was adding content to the test site. This step was accomplished much more rapidly than normal, as the content had previously been written and the original designer had a firm understanding of HTML, which allowed me to copy and paste large sections of the HTML. One new element for this website was displaying RSS feeds for blogs in the index page sidebar. This was accomplished with RSS2HTML. In mid-July, we met to review the content before launching the site. Once again, minor changes were suggested, which were made during the meeting. Once the website content was approved, the website was launched.